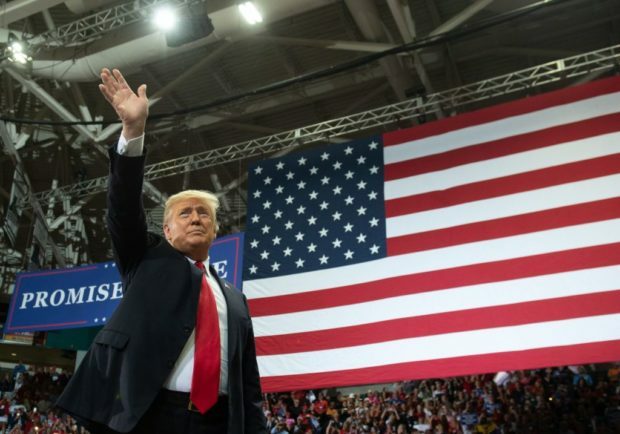 President Trump continued to promote his plan to end birthright citizenship during his rally in Estero, Florida on Wednesday night. “The Democrats want to continue giving automatic birthright citizenship to every child born to an illegal alien. Even if they’ve been on our soil for a matter of seconds. Hundreds of thousands of illegal immigrant children are made automatic citizens every year because of this crazy policy and they are instantly eligible for every privilege and benefit of American citizenship at a cost of billions of dollars a year,” Trump stated. The president recently raised the issue during an interview with Axios’ Jonathan Swan on Monday night. During the interview, Trump explained that he doesn’t believe there is a need for a constitutional amendment to overturn birthright citizenship. Despite the president’s claim, many have said that an executive order would not be sufficient to overturn it. The president was in Florida on behalf of Republican gubernatorial candidate Ron DeSantis and Senate candidate Rick Scott. Both are in tight races going into the November 6th election.